Provide comfort for the family of Mary Lou McIntosh with a meaningful gesture of sympathy. Mary Lou (Perry) McIntosh, 80, of North Huntingdon, died Sunday January 20, 2019 in the Excela Health Westmoreland Hospital, Greensburg. She was born February 24, 1938, in McKeesport a daughter of the late Robert W. and Vivian (Dunn) Perry. Prior to her retirement she was employed as a proof reader for Equibank. 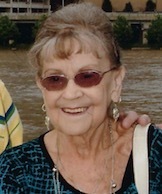 She was a member of the First Presbyterian Church in Irwin and also a social member of the Fraternal Order of Eagles and the Loyal Order of Moose both in Irwin. Surviving are two sons Lloyd McIntosh and his wife, Rennae, of North Huntingdon and Ronald McIntosh, of North Huntingdon; eight grandchildren, 14 great grandchildren, one great great grandchild; a brother Robert Perry and his wife, Linda, of NC and a nephew Matt Perry. A memorial service will be held at a later date and will be announced. Entrusted with the arrangements is the Ott Funeral Home Inc. 805 Pennsylvania Avenue Irwin. To plant a memorial tree in honor of Mary Lou McIntosh (Perry), please visit our Heartfelt Sympathies Store.